A hero doesn’t have to be bigger than life. There’s no super-being intent on saving the world. Heroes are usually ordinary men and women who stand in the gap and do the right thing for the right reasons. They become extraordinary by what they chose to do with the circumstances they’re given. Last year, Sgt. Dakota Meyer became the first living Marine in over thirty-eight years to be awarded the Medal of Honor. It was September of 2010 when Meyer’s patrol, along with another patrol of Marines and Afghan soldiers, was ambushed near the remote village of Ganjgal, Afghanistan. Though wounded himself, Meyer braved heavy enemy fire not once—but five times to rescue thirteen injured Marines, twenty-three Afghan soldiers and recover the bodies of four dead Marines. So, is doing the right thing what makes a hero? One frigid winter day, a dog slipped from the ice into the river that runs behind my office building. Someone called 911, and others donned their parkas and headed down to the river to try to help. 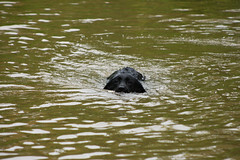 The rest of us had front row seats as the young black labrador swam upriver and downriver, checking both banks in an effort to find a way out. He simply couldn’t lift himself up and onto the ice that rimmed the banks without help. The ice slabs weren’t thick enough to hold a person’s weight so we waited, white-knuckled, for the emergency responders to arrive. When the fire truck pulled up with lights and sirens, it quickly became apparent their sole purpose was to keep people from attempting to rescue the dog and potentially create a much more dangerous situation. Although my mind could totally grasp the logic of that, it seemed cold and uncaring in the face of that dog, now tired and freezing, swimming frantically from person to person along the bank as though asking if someone would please save him. On the opposite side of the river from the firemen, two men carried a canoe toward the river, set it down on the ice, climbed in and pushed off with their paddles until they launched into the water. They paddled toward the dog and, as soon as the dog saw them, he swam out into the fast current to cross the river again. When he came alongside, one of the men grabbed him and hauled him into the canoe. The poor animal was so cold and exhausted he lay motionless in the bottom of the canoe until the men delivered him to the firemen. Maybe these men were foolish to attempt a rescue under the circumstances. Certainly, if the emergency responders had been close enough, they would have prevented the men from trying. It could have ended badly, even putting others at risk. Were they heroes? To many of us who watched these events unfold, they were heroes of epic proportion. Perhaps heroes don’t always do the right thing. Maybe, under the right circumstances, they do the wrong thing for the right reasons. Were they right to take the risk? This entry was posted in Heroes and tagged Dakota Meyer, Medal of Honor, United States Marine Corps. Bookmark the permalink. I thoroughly enjoyed your post. Great topic and awesome examples of the true meaning of hero. Thanks for stopping by, Vonnie! I’ve been contemplating heroes a lot lately! Real heros are thinking people. The marine obviously didn’t throw caution to the wind and run carelessly into enemy fire. He says he ‘did his job’, which would have been to go through all of his options and choose the best course. The same for the dog rescuers. It seems to me that they had a great idea and that the odds were with them. So they took the calculated risk. And I think the first responders should have been on the shore yelling ‘Way to go’!! I’m with you! Way to go! Thanks for commenting. You keep making me cry, (and think!) Heroism is essentially something bigger than expected, the going beyond what most people would do, despite what that Marine said. The act itself may be huge, or very small, but it is ALWAYS exceptional and as such, it is, in some ways, sacred, and should be honored. You are so right. I think one selfless act of bravery creates ripples that go on and on long after the original act has been forgotten. Sorry for making you cry!